Home » Blog » How to get rid of a Serious Red Mite Infestation. How to get rid of a Serious Red Mite Infestation. I went on holiday for a couple of weeks to come back and find one of my chicken houses was full of red mite! Not just on the ends of the perches but in every crack and crevice and in every corner. A red mite infestation is notoriously difficult to remove. Once they get a grip on a chicken house, they seem to be there for weeks. It’s a common story when the weather is warm, red mite multiply very quickly (their life cycle is complete in about a week) and before you know it, you’ve got a serious infestation to deal with. Here’s how to get rid of red mites on chickens. But first… If you’re not familiar with red mite at this point, before you read on, I would strongly suggest you pop over to my ‘Ultimate guide to red mite‘. This gives the low-down on this nasty little red ecto-parasite, it’s lifecycle and has photos to help you identify it. Clean out the house, remove all loose bedding material. Strip the house down as much as you can. Remove as many parts as possible including pop holes, automatic pop hole openers and anything else that will unscrew easily. If you have a felt roof, remove this – yes, unfortunately you will need to re-felt the roof or replace it with something less ‘mite friendly’. If you don’t you will find millions of red mites will still live happily under the felt. Soak the cracks with Poultry Shield (other brands of liquid are available, this is just my favourite and is very safe to use). Using a high pressure hose / pressure washer, wash the house and parts down. Get the spray in every crack and crevice. This will take about 45 minutes if done properly. If you miss a crack, hundreds of mites could be hiding in there so it’s really important to make sure you get into everywhere possible. The spray will bounce back and soak you at times so wear old clothes and be ready to get wet and potentially covered in some mites, Urrhh. Wait for the house to dry 10 to 15 minutes. Now look at it carefully – you should see red mites crawling around. These are the guys that are disturbed and were missed during the first treatment. Spread generous amounts of Diatom on the bedding material. 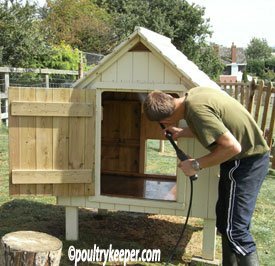 Soak again with Poultry Shield then go over the house again from top to bottom with the pressure washer, again concentrating on the cracks to disturb the red mites. Repeat the above process as many times as necessary until there are very few mites coming out. The more you remove, the better. Even small populations can multiply quickly. Put your house back together. If you had a felt roof, leave re-felting until you are mite free for a couple of weeks. A temporary waterproof material like plastic is ideal. Add fresh bedding material as you would after cleaning normal. Sprinkle a generous amount of diatom on the bedding. The manufacturers recommend 500g per Meter squared which is a lot. 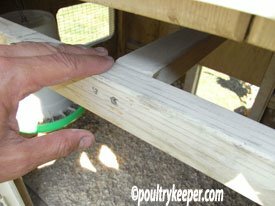 into each perch, taking particular care around the ends and the underside. When you have finished it will be white and smooth, like a gymnasts bar. Red mites have to crawl over this to get to the chickens at night. Monitor the house for a few days, particularly on perch ends and re-apply diatom to the perches every couple of days or as soon as it starts to wear off. 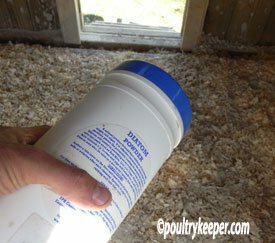 If you got into the cracks successfully, you should notice a drastic reduction in the number of red mite in the house – if you still find reasonable numbers, make up a spray mixture of poultry shield and spray these areas using a hand-held plant mister. Continue using diatom for a few weeks until there are no more signs of red mite. You will find lots more information in my Ultimate Red Mite guide. If you have any other tips on how to get rid of red mites on chickens and controlling red mite or would like to leave a comment then please feel free to do so below. 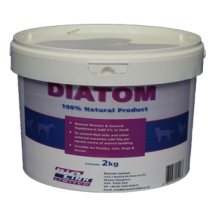 You can buy Diatomaceous Earth from specialist poultry product suppliers, many who sell on Amazon. I usually buy a large tub around 2KG as shown to the right but I also bought a small puffer bottle / shaker that is useful because you can refill it from the big tub making it easier to apply and less wasteful. Good luck – I hope you manage to get on top of your red mite problem!